"I've had to give up a lot. I've even had to give up my name. But as long as I'm alive and can think for myself, there's hope." 8 What is a living magical program? Life has been full of ups and downs for Bell. A magical construct in the form of a Belkan Knight salvaged from the Dusk Zone by Eclipse, she was surprised to discover that she was only true to herself when transformed into her civilian form, which was supposed to be a false identity for the sake of infiltration -- and she hated being Eclipse's darkness-corrupted weapon "Nightbell". She quit Eclipse as fast as she could, but the mysterious shadowy figure who brought her into Eclipse in the first place isn't the sort to take no for an answer. Now, when she's not fighting evil and defending against her pursuers, she has to remain in hiding, forced to abandon her civilian identity as "Akari Hayabusa", and still recovering from the death of Yuki Murano, the Eclipse scientist who activated her, and who she somewhat thought of as her mother. Not On Her Last Legs March 31st, 2019 Immediately after Bell's Night Out, Mari helps Bell reach the ECFH, where she gets healing from Daisuke. Akari Apprehension! March 14th, 2019 Lacrima gets a more urgent order to go after Akari at School of all places. Lacrima drags Unmei along for another fake ambush. Luckily, Rei, Millie and Rashmi are there to protect her! Mocha and Milk March 12th, 2019 Signum and Zafira drop by Gullwing Coffee. While Akari is working there. Mutually-Supporting Sisters March 10th, 2019 Akari is feeling worse about Dr. Murano's death. Sakura is heartbroken over Yukito turning her down. With Haruna's assistance, they're at least able to find support in each other. The Earliest Memory of Clara Meriva March 7th, 2019 While Haruna is getting coffee in the Gullwing bunker, Akari wakes up from a dream which completely throws her perspective on life for a loop. His Best Elsa Impression February 26th, 2019 Jadeite plays bait, Zafira takes the bait, and Akari comes running to the rescue when this trio of misfit toys collides. The results might be mixed, but hey, nobody got linker-ganked! Burgers at the Crown February 22nd, 2019 Akari and Millie head to the Crown, where they meet a man named Yagami. They have a friendly conversation, little knowing that he's actually Zafira. Knowing How You Feel February 17th, 2019 Akari meets with Runealy and Fate to talk about something the three of them have in common: what it's like to lose a mother figure. Taking Flight Once Again February 13th, 2019 Akari shows off some of what she can do, now that her Linker Core is recovered and no longer has a limiter in her human form. Of course, the topic of conversation gets heavy in the process. A Chance Meeting of Great Snackisfaction February 6th, 2019 Nanoha and Fate and Akari meet Hayate! They talk about ice cream, family and making a bunch fo sweet potato chips! Nanoha, Fate and Akari talk about Akari's recent goings ons via device chat. Pre-Practice Chat February 2nd, 2019 Akari and Millie have a chat about feelings. By the end, things are back to ... well, about as normal as they get at the moment. An Odd Checkup January 31st, 2019 Rei drops by Gullwing Coffee to check up on Akari. The verdict is good. Lending Her Strength January 25th, 2019 Right before they head out for their daily training, Akari has an interesting request for Millie: she wants her to use Rubindorn and Ritterglocke so that they can have a better picture of Akari's situation. However, their subsequent walk from the coffee shop is interrupted. New Puella, old problems January 18th, 2019 Erato meets with two(heavily weakened) defenders of light! And discuss many important things... Also, pranks are fun. The Same Favor Again January 14th, 2019 Akari decides not to mess with what works, and asks Runealy for help with the dark energy contamination she got from the Wolkenritter's mysterious book. Emergency Shutdown January 9th, 2019 Akari and Millie are headed to Gullwing for post-training snacks. Signum and Zafira want their Linker Cores. Nothing goes as planned, especially when you panic. Have You Tried Switching Your Sister Off And On Again? January 9th, 2019 After the events of Emergency Shutdown, Sakura rescues Akari and Millie, and uses Ritterglocke to give Akari quick repairs. The conclusion is obvious: the Wolkenritter aren't as evil as they seem. With Rubindorn unable to talk much, Akari invites Millie to stay the night. Putting Yourself Back Together January 6th, 2019 Millie comes to visit Akari in Haruna's bunker and learns the horrible truth about why Akari has been incommunicado all week. However, Akari has spent that time recovering, and is nearly ready to return to work and to patrols. Things You Can't Take Back December 30th, 2018 CONTENT WARNING: Blood, NPC Death - Lacrima needs to finally make an attempt to bringing Akari back to Eclipse. Luckily, Sailor Mars shows up to protect her! Not so luckily, Saint George does something he can't take back. Life After December 30th, 2018 The morning after the events of Things You Can't Take Back, Akari hasn't come in for work, so Haruna and Sakura come to investigate. When she finds out what happened, Sakura gives Akari ALL the hugs! A Special Gift December 22nd, 2018 In an attempt to steal christmas, the Grinches and Krampuses of the dream realm swipe something more deeply important. The mahous give chase and find more than they bargained for as a result. Practice Makes Protection December 21st, 2018 Makio comes across Akari and Millie training in the park, but the proceedings are interrupted by a storm cloud youma! A little advice abouts boys, Part 1 December 20th, 2018 Sakura asks her big sisters for advice on confessing her love! Now, stay tuned for the exciting conclusion of Sakura's love life! A Real Magical Girl December 17th, 2018 Unmei and Akari discuss their respective current situations, plus Unmei's new merch. Wolf Writers December 10th, 2018 Minako heads to Gullwing Coffee to meet Akari! The two discuss Eclipse, Lacrima, the mysterious silhouette, and the Wolkenritter. Staying Safe December 9th, 2018 Millie discovers that Akari is Gullwing's latest employee. The two talk about life, and Akari's current situation. Working with Another Big Sis December 8th, 2018 Sakura and Akari chat a bit while working at the Gullwing Cafe. Safer Places Than Warehouses: A GUIDE FOR THE MAGICAL REFUGEE December 6th, 2018 The new book from C. Gull, coming soon. Also Haruna helps Akari find a place in her magical bunker basement while she gets back on her feet from running from Eclipse and a breakup. Clotho's linker core December 4th, 2018 Clotho meets Signum and tries to fight her one on one! It... goes about as well as could be expected. Fortunately, Akari is there to haul her somewhere safe. Frybery December 3rd, 2018 Kyouko is in a Bad Mood. Unmei attempts to bribe her with fries to minimal effect. Akari also happens by and nearly gets interrogated. Broken Shield December 2nd, 2018 In the aftermath of Mining for Trouble, Akari teleports to the ECFH balcony with the injured Millie. Lacrima and Kunzite come to help soon after. Away from Eclipse's Eyes November 28th, 2018 Akari and Lacrima meet in the ECFH and talk about current events. Talking point number 1: Akari is single again. More Intense Practice in the Park November 23rd, 2018 While Akari and Millie are training in the park in the hopes of someday being able to take on the Wolkenritter, Kukai drops in. The Core of the Matter November 21st, 2018 Just on the heels of 'Shame and Duty', Nanoha Takamachi, Akari Hayabusa and Cure Shield encounter the Wolkenritter- Signum and Zafira, mistaking them for potential friends--- until they steal Nanoha's linker core and all heck breaks loose. Existentialism November 21st, 2018 Akari comes home to the hideout after the events of The Core of the Matter. By the end of her conversation with Mikoto, she has a plan. Cheesed Off November 18th, 2018 In her first battle post-purification, Akari faces a pizza-youma alongside Mikoto, Millie, and Jiaying. Back Home November 15th, 2018 After On Her Way Out, Akari and Mikoto return to the hideout. Akari invites Mikoto and Hikari to join the Aces. On Her Way Out November 15th, 2018 On her last day at the Waldians' home, Akari has a chat with Fate about joining the Aces. A Work in Progress November 14th, 2018 Sakura visits Akari at the Waldians' home, where they have a chat about how far Akari has come. Safe Room Chat November 12th, 2018 (CW: allusions to abuse) While Akari convalesces in the Waldians' safe room, Fate stops by for a chat. Akari learns she isn't alone. Life Without Darkness November 12th, 2018 After the events of Safe Room Chat, Mikoto drops by. They chat about several things. Let This Cruel Shell Be Ripped Away November 11th, 2018 Akari and Mikoto visit the Waldians' house in Mitakihara, so that Runealy can attempt to purify her. The results are initially ... painful, but better than expected. Making Arrangements November 10th, 2018 After the events of About Your Girlfriend, Akari and Mikoto arrange a meeting with Princess Runealy. Plans are made, both for defense and for purification. On Creatures of Darkness November 9th, 2018 Akari and Millie happen to cross paths, and team up to fight a panther-youma. Millie then adds herself to the growing number of people who are willing to defend Akari against Lacrima. Those Who Remained November 4th, 2018 A continuation of Trouble in the barrier Garden, wherein the two who stayed behind fight further and also escape! Back Home November 4th, 2018 After the events of Those Who Remained, Akari comes home to Mikoto's hideout. Mikoto was worried -- and rightly so. Trouble in the Barrier Garden! November 3rd, 2018 Runealy, Gaofele, Akari, Jiaying, and Tyrfing go to investigate a garden! They encounter The Thorn and learn some information before they're forced to flee! ... Except for Jiaying and Akari... what will be their fate?! Bad News November 1st, 2018 Ami tracks down Akari, and delivers the bad news about the situation with Lacrima. But there is hope. I'm Not Freaking Out November 1st, 2018 After the events of Bad News, Akari's number one priority is of course letting Sakura-imoutochan know about the situation. Togetherness November 1st, 2018 Akari and Mikoto talk about the situation with Eclipse. Both of them are confident, in the end. The Good, the Bad, and the Crunchy October 24th, 2018 Part of this complete Stahlfist! A breakfast cereal youma goes on a rampage, and Nightbell is the first to the plate for getting rid of it. The cornflakes get soggy as the fight goes on, meaning that "crunchy" is less-than-accurate for the monster. It soon becomes clear to the heroes that "bad" isn't all that accurate for Akari, either. Dreams of Ancient Belka October 20th, 2018 After months of only ever sleeping in her Nightbell form, Akari has the first dream she can remember! It leads to an interesting discovery. The Only Things I Know Are Real October 14th, 2018 Nightbell and Tessen have their promised duel. Then Akari and Mikoto figure out the truth about the relationship between "Akari" and "Nightbell." Hagane and Frau Doktor October 13th, 2018 While investigating into UMBRA's current events, Hagane comes across Dr. Murano. Some information and questions are exchanged. The Bell Tolls October 11th, 2018 Nightbell rigs up the toll booths to drain energy. Due to the warning she gave Sakura during Cutest Bully, things go horribly even by Nightbell's standards. But it looks like words (and Sakura's hugs) are starting to work on her. Cutest bully October 6th, 2018 Lacrima decides to Bully Sakura and take the darkness card. Sakura would have fought but... Her wand wasn't working. Oh dear. Fortunately, Big Sister Bell came to save the day! Two Knights and a Monster September 29th, 2018 Nightbell and Stahlritter have the world's most uneasy teamup against a shadowy dragon-youma. Sister meets Sister September 26th, 2018 Sakura introduces Haruna and Akari, best big sisters! Also, find out Taka is okay! Ish. Akari's First Date September 16th, 2018 Akari and Mikoto stop for ice cream, when suddenly Akari asks a question which changes the course of the conversation quite a bit! A Walk in the Park and the Maze September 11th, 2018 Nightbell and Sakura have a philosophical heart to heart which mostly takes place in the Maze Card. Back in the Saddle September 9th, 2018 Nightbell tries out Dr. Murano's new Zerobot, a robotic horse. Things go very badly as a result of Sakura-imouto showing up. Friends On Opposite Sides September 1st, 2018 Nightbell apologizes to Rashmi for smashing her through a building. The ensuing conversation goes a lot better than she expected. Confessions and Final Judgment August 27th, 2018 Nightbell invites Sakura over to talk about the birthday Sakura missed, and Sakura gives her a present. Then Bell accidentally reveals the stakes if Sakura loses. A Belated Birthday Party August 26th, 2018 Akari's birthday party with Mikoto, Rashmi, and Fate at the Korma Chameleon. Ring the Bell August 24th, 2018 Bell and Tarnished have a training match which results in some high intensity emotions. In the end, Tarnished runs her through some of her tai chi exercises and the two calm down with meditation. Rooftop Meet and Greet August 19th, 2018 Nightbell and Tarnished meet on the roof of Infinity University. Tarnished has an interesting proposal. Urban Jungle August 18th, 2018 A Silent Sand-Gorilla punches Kokoro to establish dominance. No one can figure out how to hold threat. A Fine Evening in the Golden Kingdom August 12th, 2018 On the evening of Empress Endymion's ball, Dame Akari Hayabusa and Dame Mikoto Nakajima of Her Majesty's Left Hand meet together in the rose garden, deciding to spend their time together rather than joining the public festivities. Then something unexpected happens. Big Sis Nightbell (Akari) August 10th, 2018 Nightbell invites Sakura over so that she can reveal her secret identity as Akari. Akari then invites Sakura to her birthday party! Thrown for a LOOP August 9th, 2018 Sakura and Bell are caught at the shrine, stuck in a loop! Fortunately, working together, they managed to cut back out into the real world. Only three cards to go... But something new approaches on the horizon. I was here all along! August 7th, 2018 Clotho has appeared(she was totally here all along!) and meets a few new magical girls in Nightbell and Star Sword(Kinda got a theme with their names, don't they?) However, the night is truly taken captive my Lamya, an honest to goodness dragon! Birthdays and Lemonade August 6th, 2018 Akari meets Mikoto and lets slip that she hasn't had much of a birthday before. Mikoto starts making plans, and Akari finds herself surprisingly touched. A Little Less Dark, Please August 2nd, 2018 Bell meets Lacrima to talk about how to control her dark energy -- both in the sense of reeling in her aggressive tendencies, and learning how to dusk step. Practice in the Park July 20th, 2018 Akari and Sora meet in the park while practicing their respective sports. Sora gives Akari a bit of extra encouragement. One More Test July 15th, 2018 Dr. Murano and Nightbell set up draining-machines on two rooftops this time, and one of them comes with a surprise! However, things get really out of hand when Cute Witch Kazeko shows up. Milkshakes at the Crown July 4th, 2018 Milkshakes, art and conversation about sparring. Typical afternoon at the Crown. Kendo Club Blues June 25th, 2018 Akari joins Infinity's Kendo Club, where she befriends Mikoto. Red Blade, Blue Fans June 24th, 2018 Nightbell and Dr. Murano's second test run is interrupted when Tessen shows up. A rivalry is born. A Chance Encounter June 23rd, 2018 Lacrima comes across Nightbell recuperating in the Dusk Zone. Dark Knights and Stars June 21st, 2018 Dr. Murano sets up an energy-draining device on an apartment building in order to draw in heroes for a test of Nightbell's combat abilities. It goes about as well as you'd expect when someone filled with dark energy picks a fight with someone who has purification powers. A little after the Warring Ages began on Belka and the Book of Darkness started leaving its mark upon the universe, a small-time conspiracy with big dreams called Doppelkreuz (Double Cross -- they meant the name literally) formed on Belka. 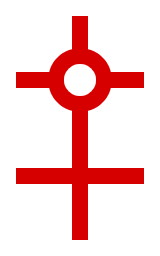 Their emblem was a double-barred cross with an open circle at the crux of the upper bar. It is ... controversial among historians whether they were good guys or bad guys, with the general consensus being that they wanted to be good but had fairly authoritarian views on how to accomplish things, but their goal was straightforward to describe: they wanted to overthrow the Saint Kings, take over Belka, and bring order to the world. Simple, really. Unfortunately, they bit off more than they could chew. They'd intended to create a dozen Griffritter units in half a year -- monstrous-looking living magical programs partially inspired by the legends of the Wolkenritter but loyal only to Doppelkreuz and its ideals, named for the "grip" they would allow Doppelkreuz to exert on the world. However, in two years, all they had to show for it was a single unit, Griffritter Nachtglocke I. They didn't even have the chance to test or even activate her, because by that point, the Saint King's forces caught wind of their operations. In the ensuing battle, one of Doppelkreuz's other experiments exploded, and part of the laboratory was blasted into the Dusk Zone -- and with it, Ritterglocke I, the Storage Device which contained Nachtglocke I, and the standby form of her Armed Device, Rubindorn. Ritterglocke I and Rubindorn lay in the Dusk Zone for the better part of a thousand years, slowly getting corrupted by dark energy, until the never-activated Nachtglocke essentially became a creature of dark energy herself. They were finally recovered by Eclipse and turned over to Dr. Yuki Murano, a professor at Infinity University who was well-versed in Belkan Devices, and who was quite surprised when an entire Belkan Knight materialized in her lab. This caught the attention of one of the higher-ups in Eclipse who only appeared to Dr. Murano as a shadowy figure on a screen (secretly Professor Souichi Tomoe), who wanted to know whether whether there were any more of her (no), whether Eclipse could create any Griffritter units of its own (no), and whether Nachtglocke could be controlled (yes, in the sense that she volunteered). Nachtglocke herself was the one who realized that her programmed-in purpose was to "bring order to the world", not "bring order to Belka", and with the Saint Kings and Belka itself long dead before she was even activated, she was free to pledge her loyalty to Eclipse. She translated her name "Nachtglocke" into English as "Nightbell", and the shadowy figure assigned Dr. Murano as Nightbell's handler, since she'd been there from the beginning. However ... things have changed. One of the core functions of the Griffritter was the Infiltrationsmodus, or Infiltration Mode. The original purpose was to infiltrate society as a sleeper agent as necessary. Her combat form has a monstrous appearance; in Infiltration Mode, she transforms into an ordinary-looking girl who is nearly a full foot shorter than her true appearance, and with a limiter on her Linker Core. She isn't physically strong enough to wield Rubindorn effectively in its sword form, much less in either of its others. It was decided that Nightbell should be given a civilian identity; they weren't sure what to do with her yet, but they wanted to make it easier for themselves if and when they did. Nightbell and Dr. Murano worked together to hash out the persona of "Akari Hayabusa" (隼 明鈴, Hayabusa Akari) -- "Akari" with the characters for "bright bell", and "Hayabusa" from the name of a motorcycle she saw in a magazine -- including a backstory that she was found as an infant and didn't know anything about her parents (which wasn't entirely devoid of any basis in reality), explaining why she didn't look Japanese but had a Japanese name. The Infiltration Mode has a limiter on her Linker Core to give her a mana-usage profile to make her less detectable; as a side-effect, this also resulted in lessened effects of the dark energy within her, and resulted in being 5% Dark Energy by volume, rather than 40%. ... The problem was, once Bell learned that last part, she realized she felt as though "Akari" was her true identity, with "Nightbell" just as a corruption. Her love for her sister led her to turn away from UMBRA and Eclipse (though her romantic relationship with Mikoto Nakajima only lasted a month after that). When she was purified by Princess Runealy Waldia, a great many of the systems for separating her human-form from her combat-form broke down as a result of having been corrupted by the darkness, with her built-in purpose being a total loss. UMBRA's vice director Lacrima was perfectly willing to let Bell go. However, the shadowy figure wasn't happy about this, and ordered Lacrima to capture "Nightbell" and reprogram her. This is an ongoing complication. Of course, in their first actual fight against each other, Lacrima's biological brother Ryo Okana suddenly crashed the battle and killed Dr. Murano, which didn't help. She was then forced to abandon her "Akari Hayabusa" identity when Mr. Mysterious ordered Lacrima to attack her at school, and Bell realized that she wasn't going to get away with trying to live her life in an identity which Eclipse created for her. What is a living magical program? Her body is a magical projection, much like a magical girl's costume or an energy shield, except that what's being generated is a human body. In this way, she is similar to a Device-mage's familiar, except that she doesn't have a base form or a connection to a master; her Linker Core was created from whole cloth. Her mind was based on a brain scan of her chief programmer, the sixteen-year-old trans girl knight Clara Meriva, with some haphazard and poorly-thought-out modifications to try to make her a good little minion. Her biology actually works, though. Well ... it doesn't work. Her vital organs seem to do what they're supposed to, she can recover mana by eating, and an entirely mundane doctor wouldn't see anything amiss ... unless they carefully observed her every day over a long period of time. Her biology is basically a bunch of moving parts which don't add up to a concrete whole. She doesn't age (she's fairly certain she's immortal) and can't have children. In her human form, exercise (or lack thereof) will change her apparent strength at a more-or-less realistic rate because in her base form is literally superhuman, so her Infiltration Mode spell can just regulate her strength. It's kind of hard to hide anything about herself when she's in her combat form, which was by design for the sake of her Infiltration Mode. In her civilian form, a quick magical scan will mark her as a human, or at worst peg her as something like a familiar, but an Intelligent Device scanning her more thoroughly would be able to see all the weirdness. She has a few preprogrammed plans for shenanigans for preventing other people from noticing the fact that she doesn't age. She still just feels like a sixteen-year-old girl, though. Schwertform (Sword Form) - A longsword with a five-foot blade and an over-one-foot handle. The blade is red, and glows faintly. For one-on-one duels. Can also materialize a metal sheath around itself. Menschenmengeform (Crowd Form) - A ten-foot double-ended polearm, specifically a spontoon. For crowd control. Rosenform (Rose Form) - In Crowd Form, it transforms into a double-bladed scythe. For when she absolutely, positively needs to shred everything around her to bits in a hurry. And she can also put Rubindorn away and fight using Belkan hand-to-hand martial arts. By discharging a cartridge, Bell can activate a spell called Handgelenke des Herkules, boosting her strength and speed even further. Before they were purified, Bell and Rubindorn both had a power-boost from the dark energy. "Akari Hayabusa" in her track suit. This page was last modified on 16 April 2019, at 22:08.